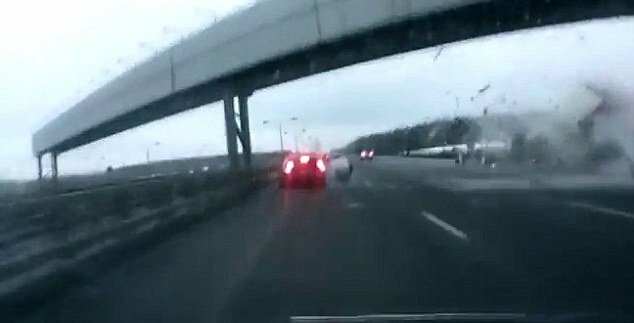 A video of Moscow plane crash has emerged showing how close one motorist came to becoming another victim of the deadly event. At least four Russians died when a passenger airliner overshot a runway and broke into pieces Vnukovo airport. Officials said up to eight people were on board the Tupolev-204 – flight number RWZ9268 – as it rolled off the runway at Vnukovo airport and burst through a perimeter fence onto a highway. And this incredible video shows how a casual weekend drive could have resulted in catastrophic consequences. The driver’s camera captures the moment the plane crashes into the highway, and you can even make out one the plane’s wheels hurtling into the vehicle in front. After a screeching of brakes and loud impact noise, the driver casually brings the car to a halt by the side of the road. State television news channel Vestishowed a photo of the wrecked plane’s fuselage with the livery of the low-cost Russian Red Wings airline. Its nose, including the cockpit area, appeared sheared off. Two people were found dead at the scene, while a third victim, a 27-year-old woman, died on the way to hospital. Three others were severely injured. The captain and co-pilot were among those killed, reported Interfax. Interior Ministry officials believe the cause of the crash could be pilot error. Light snow was falling in Moscow at the time. The plane was flying in from Pardubice, in the Czech Republic after dropping off tourists and then returning to its home Moscow base with just crew on board. A criminal case over possible flight safety violations has been launched, said official spokesman of Investigative Committee Vladimir Markin said. The preliminary cause of the accident is pilots’ error, he added. Early reports say the jet, crashed at around 16:35 local time after being forced to make a second landing attempt. It rolled out from the runway into Kievskoye Highway, fell into three pieces and caught fire over 100 square meters. It has been claimed that vehicles used by Vnukovo firefighters were being repaired so the first emergency crews to appear on the scene arrived at least than 50 minutes after the blaze broke out. Prior to Saturday’s crash, there had been no fatal accidents reported for Tu-204s, which entered commercial service in 1995. The plane is a twin-engine mid-range jet with a capacity of about 210 passengers.